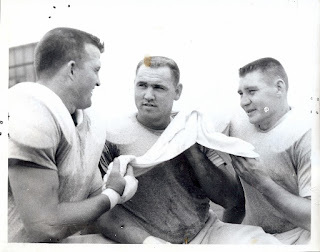 Bob Dee, Bob Lee and Bob Fee of the Boston Patriots. Bob Dee had the greatest career of the three Bobs. After playing two initial season with the Washington Redskins, Dee re-started his football career in Boston in 1960. 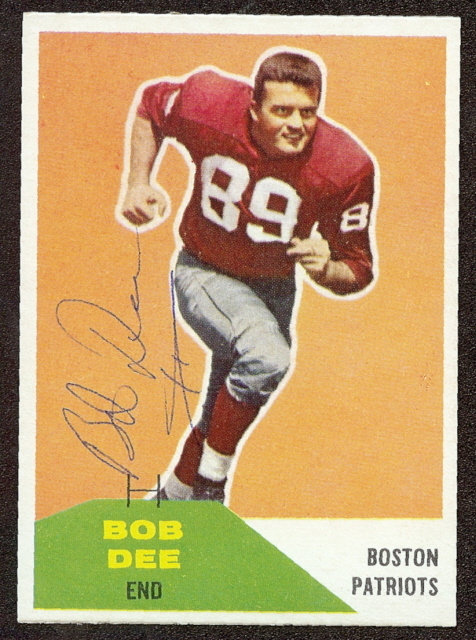 He played on Boston’s defensive line through the 1967 season when he retired to embark upon a business opportunity that was “too good to resist.” Bob Dee left the Patriots as a four-time AFL All-Star who started 112 consecutive games. Years later his number 89 was retired by the Patriots, he was selected as a member of the Boston Patriots All-1960s Team, and he was inducted into the Patriots Hall of Fame. Bob Lee was an offensive guard out of the University of Missouri. Lee managed to get into eight games with the Patriots in 1960, after which his professional football career ended. 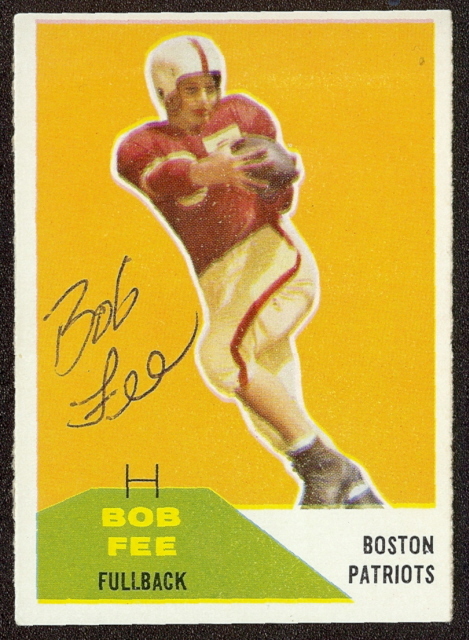 Bob Fee got cut in training camp, and thus never played in a regular season game. I managed to track him down in an effort to get his football card signed. After receiving my letter, he called me on the phone from Massachusetts. He said that he had gotten my phone number off of the stationary from my autograph request, and thought he would give me a call. He is now 76 years old, and participates in the Senior Olympics. He has run 31 marathons in his life, but at his age he hates having to do long training runs in the Massachusetts cold, so he now does the 100 and 200 meters. He will be competing in Texas in March. He said that he gets 3-4 requests to sign his card each year and always enjoys doing it.